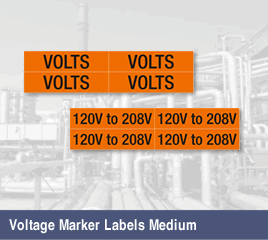 With a variety of voltages to choose from, you can find the right-sized voltage marker label with the correct voltage, to mark your electrical equipment safely and effectively. • A high-bonding adhesive bonds to most surfaces. • Choose from a number of voltages and other messages for your equipment. • Bold text and orange backgrounds stand out in any environment.